Click here for an updated post with information as of 5 p.m. Sunday. 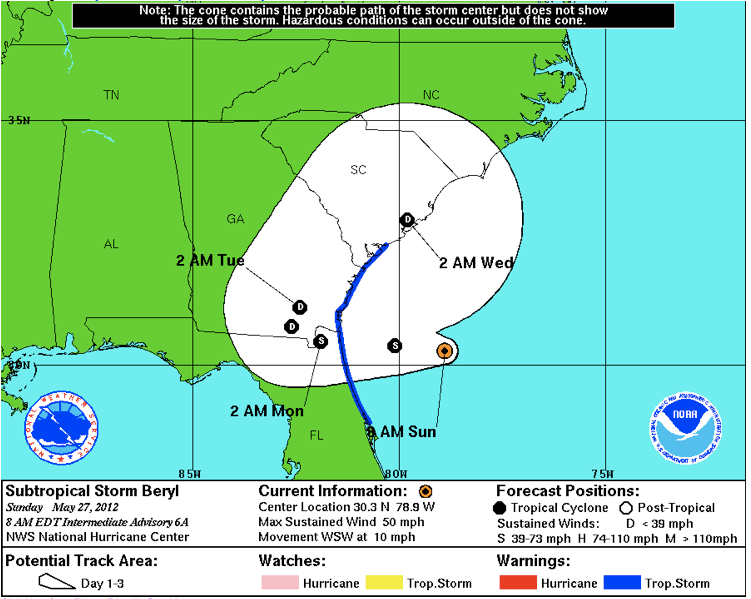 As I write this on Sunday morning, subtropical storm Beryl is headed for landfall late Sunday or early Monday somewhere along the Georgia/Florida state line. Winds have picked up overnight in the Savannah area, and we’re very likely to see a band of rain come in from the east before noon. 35 people had to be rescued from rip currents at Tybee yesterday — that’s a clear threat along with potentially heavy rains and strong winds. Beryl is not expected to come anywhere near hurricane strength. A TURN TOWARD THE WEST IS EXPECTED LATER TODAY…FOLLOWED BY A DECREASE IN FORWARD SPEED TONIGHT AND MONDAY. ON THE FORECAST TRACK…THE CENTER OF BERYL WILL APPROACH THE COAST WITHIN THE WARNING AREA TODAY AND MAKE LANDFALL TONIGHT OR EARLY MONDAY. AFTER LANDFALL…BERYL IS EXPECTED TO MOVE SLOWLY WEST-NORTHWESTWARD AND THEN TURN NORTHWARD OVER PORTIONS OF NORTHEAST FLORIDA AND SOUTHEAST GEORGIA ON MONDAY AND MONDAY NIGHT. MAXIMUM SUSTAINED WINDS ARE NEAR 50 MPH…85 KM/H…WITH HIGHER GUSTS. Please note that there remains considerable uncertainty in the models about where or when Beryl will make its U-turn and head back out to see. The current projection has it staying over land on the southeast coast longer than the forecast track previously did. We could get 3-6″ rain out of this thing.